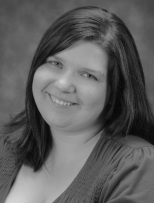 Leazah Behrens is a freelance theatrical designer in the Twin Cities area. She specializes in Scenic Design, Properties Design, Scenic Artistry and Publicity Design. She holds a M.F.A. Theatre Arts: Scenic Design from Wayne State University's Hilberry Repertory Theatre and B.S. in Theatre Arts and Art: Graphic Design from Southwest Minnesota State University. The story unfolds on a multi-level set that looks less like buildings in a city than rocks in the wild, adding to the dreamlike fairy quality of the production. Each time a character dies, red rose petals are strewn over them; by the end of the show the stage is littered with rose petals. The design team (including sound and music designer Tim Donahue, lighting designer Heidi Eckwall, and scenic designer Leazah Behrens) have done a great job re-creating the look of Press Your Luck, with flashing squares of color hung across the back of the stage, accompanied by the familiar sounds. The three contestant podiums are also used as various other set pieces when we break away from the game show. The Hilberry production wows you even before it starts courtesy of Leazah Behrens’ set, which cleverly depicts all three levels of Violet’s crumbling home. Designer Leazah Behrens fills up the stage with the house's many rooms and floors, looking straight through the walls (as if by X-ray) in a manner that makes the space somehow feel both tremendous and stifling. The production team for August: Osage County is every bit as on their game as are the actors. Leazah Behrens's sprawling set fills the Hilberry space with utility, care, and creativity. With the bones of the house showing, the very foundation of the family is laid out for us to see. Every little nook and cranny is filled, and alive. Sprawling rugs and lush drapery dominate an otherwise sparse stage, transporting the audience from her husband's bed chamber to exotic locales that are imagined simply through performance and the power of words -- a spectacle to be seen.